Molen (Mill) - Mill in Sunlight (1908). 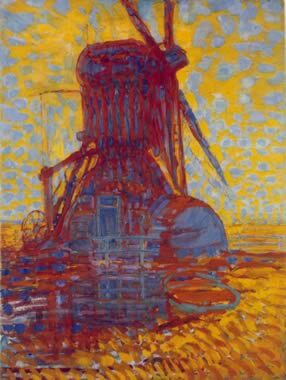 In September 1908 Mondrian spent two weeks at an artists' colony in the seaside town of Domburg in southwest Holland. There, through the Dutch painter Jan Toorop, he learned the pointillism of Seurat and the fauvist colours of Matisse. The result can be seen in Woods near Oele, in which Mondrian's familiar motif of trees by the water is charged with glowing spots and streaks of paint. The vibrating sun points to the pantheism of van Gogh and the sweeping brushstrokes recall the symbolism of Edvard Munch (The Scream). Mondrian had become interested in theosophy, a blend of Eastern and Western religious ideas that affirmed the gradual evolution of humanity toward a spiritual unity. It was during this time that his fame started to spread. In 1909 he had a sudden rush of fame, and his paintings sold in large numbers. This sudden change in direction is largely attributable to his contact with French Neo-Impressionism and Fauvism. Mondrian painted the fields, farms and canals around Amsterdam and his works at this time reveal a great love of trees and nature. This can be seen in the 1910 watercolour painting Amaryllis, in which delicately painted flowers are beautifully arranged on the paper. Another painting, Avond (Sunlight) - Red Tree of 1908 is a realistically executed tree - correct in all senses of the word.